When the Holiday's come calling and you are looking to update your Holiday beverage repertoire, there are not too many things better than a toasty warm, spiced mug of mulled wine on a cold, crisp winter day. Mulled wine has a special place in my heart because it reminds of my time living in Edinburgh-- Scotland's magical capital city and the place I met my husband. It's historic cobblestone streets are home to some of the most wonderful Holliday markets, replete with quaint German style stands serving baked goods, little gifts and of course steaming mugs of mulled wine. Walking down the cobbled streets, all bundled up against the cold and smelling the spicy, cinnamon-y aroma of mulled wine, toasted nuts and warm baked pastries is a fond memory of mine and has found its place among holiday traditions in my home. 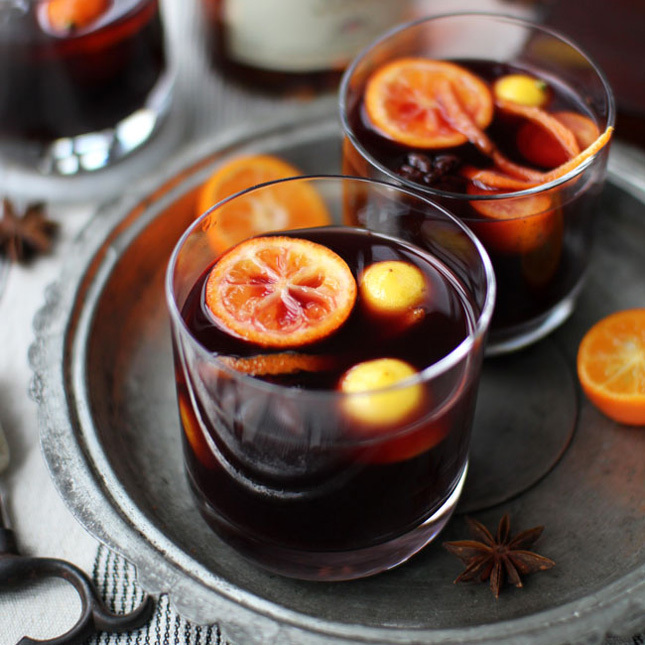 Besides being tasty, mulled wine is one of the simplest drinks to make. 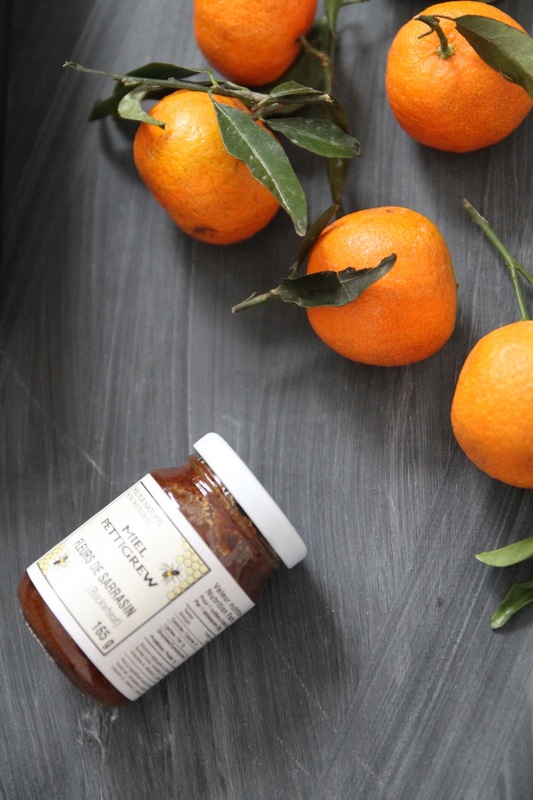 Grab a handful of Christmasy spices--cinnamon, anise seed, vanilla, cloves and the peel of one large orange or the peel of several sweet clementines, add a dash of honey or sugar, put it in a pot on low heat and you have yourself a tasty belly-warming drink. I like to finish mine with a gourmet garnish like a candied pear slice, orange peel and of course each glass needs a cinnamon-stick stirrer! You could even do a non-alcoholic version of this with apple juice... but why would you? Check out the detailed recipe below to get your Holiday Spirit on! In a larger pot pour the 1 liter of red wine and slowly add the infused water with or without the spices (I like keeping them as I think it looks festive but some people prefer to toss them) Slowly warm the wine and infused spice water until the wine is warmed through (make sure not to boil the mixture, as you will burn off the alcohol) Serve in cozy mugs or thick whisky tumblers, add a splash of brandy and a cinnamon stick and you're all set! P.s to do the candied pear garnish simply slice a pear into paper thin slices place on a baking sheet lined with parchment/wax paper and drizzle with honey. Bake in an oven set at 350 degrees for 10-12 minutes or until pears are golden, let cool and use as garnish for your mulled wine, on top of ice-cream or as a pear cracker for blue cheese! Here at Autumn Wood Stylist HQ we are currently sipping our coffee, listening to Christmas music (too early?) and getting excited about Thanksgiving Dinner! As always if you're ever in need of a prop-stylist, photo-stylist or event designer we're here to help! Check out our services page and our contact page for more info on how to get in touch. Stay warm readers... and no one has to know theres a touch of brandy in that mug! P.s we're kinda in love with this monogrammed mug from Anthropologie! *photo credits: Edinburgh photos from the tourism board of Edinburgh, bottom left photo of montage is provided by 100 layer cake and top right photo of pear by Adventurous heart. All other photography is mine unless noted differently or is purchased stock photography.